This resembles some of the ideas I've had while standing in a crowded subway here, so it will be interesting to see it in practice. According to this page, eight cars of this type will be made by the end of the year, so very limited so far - a single train is composed of twelve cars, I believe. 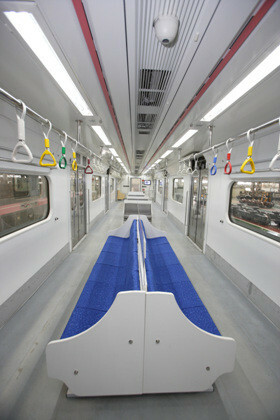 Passengers standing will also have a bar by the window to make standing more comfortable, and looking at the image it seems to be located just above the window. Edit: here's an image of a monorail in Kuala Lumpur using this design. 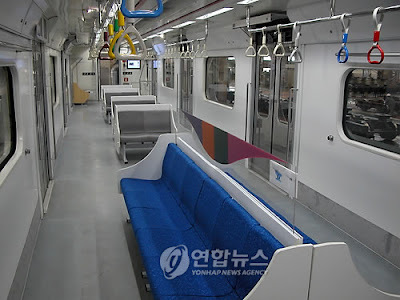 It's much smaller though than the subway cars in Seoul. And while we're on the subject of passenger comfort, last time I was flying on a plane over the Pacific I couldn't help but wonder (I'm 194 cm or 6'4" so I always think about these things on the plane) why airlines try so hard to conserve space as much as possible but still have the safety guidelines in a big open pocket in the front where your knees are, very often with a stretched elastic causing it to remain sloppily half open. Why not a pocket that folds completely into the back of the seat in front instead?